One of my goals in coming to Mendoza was to add to my collection of Extreme Wine stories (yes, I’m working on another book). I was thinking that the story would be the Great Malbec Boom, one of the most extreme regional wine surges in recent years. The Malbec boom may still make my extreme wine list, but a fellow wine economist suggested a different entry: Tempus Alba‘s ambitious project to create an extreme wine, one that uniquely captures the essence of Malbec. Here’s the story of Vero Malbec. The Biondolillo family has been in the winegrowing business in Mendoza for more than 100 years. This means that they have lived through booms and crises, both in the wine industry and in the Argentinean economy more generally. Aldo Biondolillo, who holds a Ph.D. in Economics from the University of Minnesota, is the third generation to make a living this way. His sons Leonardo and Mariano are in the family business, too, and there is a very young fifth generation in the wings (if you look closely you can see their fingerprints on the wine label in the video above). Theirs is the kind of business that necessarily looks to the long run. When Aldo began the Tempus Alba project in the 1990’s he was looking for a way for his family to continue the winegrowing tradition well into the future. He knew that they couldn’t live on grape sales alone and becoming a bulk wine producer would be a dead end road. Commodity pricing — of grapes or bulk wine — often puts an emphasis on cost more than quality – and there is always some one who will charge less. Economic theory teaches that product differentiation is key to escaping the commodity trap. But how? Aldo’s project is ambitious: to create not just another good Malbec, but a different idea of Malbec. His method is to isolate the purest or perhaps just the best Malbec vines in the region from among the many different clones that have been planted here over the years. The goal is to identify the truest clones and, in the long run, to make them available to other wineries who could join a circle of producers making unique wines – unique in terms of the particular grape clones and then unique once again as expressions of their respective terroir. And so Aldo and family began, planting 800 different Malbec cuttings in the Mother Block. The 800 vines were narrowed in stages to 589 vines and then finally 20 by teams of experts. After 10 years of hard work, the project’s first commercial Malbec was made in 2007. It is called Vero Malbec (vero is Italian for truth, although the letters are also the initials of Aldo’s grandchildren). The Biondolillo do not claim that it is the original Malbec brought over from France or The One True Malbec. It is their version of the truth, seen from their family’s particular 100 year perspective. Our visit to Tempus Alba’s beautiful winery in Maipu was informative in several respects. First, It was interesting to see a project that is at once so scientifically ambitious (the labs and the clones) and, through the winemakers’ circle idea, so socially progressive. Although there is a lot of plant science employed here, however, the work to narrow down the cuttings was done using nose and palate, not by sequencing grape DNA. I accused Aldo of being an empiricist in his search for true Malbec and someone in the group said, “Well of course … he’s an economist.” Aldo and I reacted in the same instant, “No, no, no!” we said in unison, shaking our fingers. We know that most economists are more comfortable with theories that with facts. (It is an old saying in economics, for example, that a theory cannot be refuted by facts – only by a more appealing theory will do the job). Wine theories are well and good, but it’s what’s in the bottle that really counts. I was also fascinated by the visitors to Tempus Alba. The other wineries we visited in Mendoza were fairly remote and sometimes difficult to find; most had guarded gates meant to restrict entry to those with pre-arranged tours. 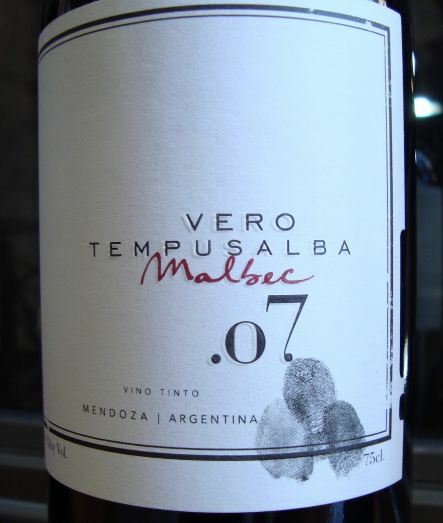 Tempus Alba’s winery is in the Maipu valley, an area with lots of wineries and a good many backpacker hostels. The courtyard was filled with the rental bikes of the 20-somethings who travel from winery to winery as long as they can manage to stay upright. The action in the restaurant and on the deck overlooking the vineyard was young, lively and fun. I’m not sure the 100+ per day biking visitors (a big wine tourist number by Mendoza standards) buy much wine, but they appear to have a great wine experience – almost a unique one it seems to me. The self-guided tour shows them the winery, teaches some viticultural science, and even exposes them to the family’s “dogma” or guiding principles. Then it is up to the sunny deck to taste the wines and have a bite to eat. Many will be untouched and just enjoy the good wine, food and company, but some will stop and think, and that seems to be the idea behind Tempus Alba’s whole approach. Is Tempus Alba’s Vero Malbec really unique? I won’t judge the wine, but certainly the idea is completely different and a potentially important addition to the rich mosaic of Mendoza wine.